The Atlantic Cup presented by 11th Hour Racing is a hard-fought, intense double-handed, offshore race held on the eastern seaboard of the United States every other spring in the even years. Some of the best short-handed sailors around the globe vie for the chance to take hold of The Atlantic Cup! 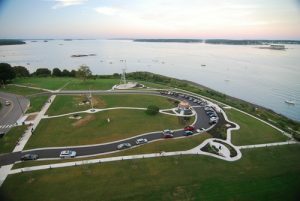 In addition, the Atlantic Cup provides shore-based activities for fans of all ages plus it is the most environmentally sustainable sailing race in the U.S.
Eastern Promenade in Portland Maine and location of the race village. The Atlantic Cup presented by 11th Hour Racing is committed to being the most environmentally responsible sailing race in the United States. Since 2012, teams and race management have worked together to create a fully carbon neutral event. As the race grows, race management will continue to seek innovative ideas and products that align with its mission. We encourage you to explore our sustainability page to learn more about the unique steps the race, its teams and its presenting sponsor, 11th Hour Racing are taking to make this a truly sustainable event. Friends of the Eastern Promenade are honored to be the beneficiary of Atlantic Cup’s first visit to our City. Festivities abound on June 10th & 11th.Visit the Race Village for a beer garden, food trucks, a kid zone, race commentary, and live music at 1:30p and 4:15p both Friday and Saturday (depending on weather conditions).